It’s been a while since I’ve touched accounting so it’s probably time for me to have a refresher. What better way than to integrate it into my blogpost this Sunday. Below I present to you the inventory manufacturing process. I’m sure it’s pretty self explanatory but let me explain in an example. Let’s say you’re trying to make pizza. The raw materials would be the cheese, the dough, the pepperoni, and the sauce. When you start putting all of this together and it’s sitting in the oven, we would consider that the work in progress phase. Finally, when it’s all baked and a pizza comes out of the oven, we’ve got the finished goods. Yes…I had pizza tonight for dinner. 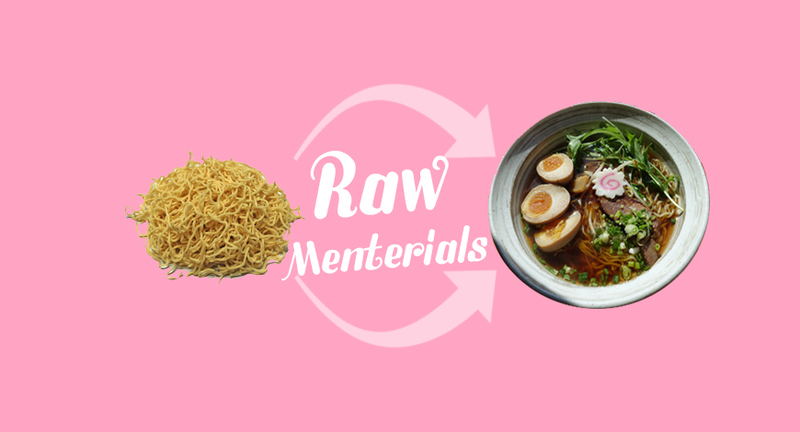 Raw Menterials – a ramen restaurant that’s so innovative you could call it the Uber of ramen. To give you some context have you ever had “Crossing the Bridge” noodles? It’s a rice noodle dish from the Yunnan province of China where you receive all the soup ingredients separate from the soup. The soup is served boiling hot so that once it’s reached your table you can put all the ingredients in to cook on spot. This is the model that I’m basing my noodles on. A version of DIY but instead CIY, cooking it yourself. You can choose your own soup base, the thickness of your noodles and the ingredients you’d like to add to your ramen. Our waiters will bring you everything along with a cute timer. The dial will be on “Raw Materials” the moment everything is set. Once you’ve dumped everything into your soup base you start the timer and the dial moves across the “Work In Progress” phase and once the timer is up DING!!!! it’ll land on “Finished Goods.” The inventory manufacturing process has ended! Where would these ramen shops be located? At the bottom of corporate offices of course!!! We all love to make puns and joke about what we do so this joint would be prettehhh popular with the accountants. Of course the name will be the factor that drives people to go but the food quality is what’ll make the people stay.